I say decidedly yes – were this only a matter of becoming visually literate. How arrogant it would be to imagine that what has happened in art during the last few years could have wiped out the validity and relevance, to an artist, of millennia of marvelous works. And these accomplishments were made in sculpture, painting, drawing. Any young artist without insight into these forms of expression, without a key to understanding the art of other times and places, who is tuned in only to current ideas, is indeed poverty-stricken. However bright, sophisticated, ingenious and successful he may be, he remains, as an artist, naïve. The insight of an artist, as distinguished from that of a sophisticated layman, a critic, philosopher or historian, is something not appealing to the idea-oriented person. It concerns the work of art rather than the idea. In painting, for example, it is first-hand understanding of the critical difference between one position on the surface and another one-hundredth of an inch away from the first, or the divergence, however ineffable, between one color and another in saturation and luminosity – these are things upon which the outcome of a painting depends and with which painters have concerned themselves, regardless of where or when they lived. To understand Mondrian, who worked for years on his paintings consisting of several lines and areas of color, is not only a matter of grasping his concept. Plasticity, which he defined as an “image of energy,” he could attain to his near-satisfaction only through innumerable and minute adjustments undergone through rounds of action and reflection over a long period of time, to extract from those several relationships the greatest possible energy. I do not believe that anyone who has never drawn, really drawn, can know a Mondrian, at least so that it can open to him, as an artist, its realm of experience. But to reach this awareness of drawing, there is only one way: to draw… to draw and to draw and to draw. There can be no shortcut designed to fit the college curriculum. I think drawing has usually been the first step in the training of an artist for two reasons. One, it is primary in initiating visual consciousness. Milton Resnick defines drawing as dividing – dividing is the beginning of consciousness. To attempt the achievement of a coherent work, of unity, without distinctions ever having been made, divisions, resolved, demands a state of total innocence, cynicism – or idiocy. Beyond dividing, drawing is also connecting – and here is the difficulty. Such effort has been lost sight of in art education today. Is this because the point of view of conceptual art has made it seem irrelevant? Or has the lack of experience on the part of young artists in the work of creation contributed to the predominance of conceptual art? What does this slow and painful preparation consist of? Surely it is not sitting around and asking profound questions such as “What is art?” or “Is painting obsolete?” It is rather experience that would qualify one to ask. It has always been the premise of study in art to be involved in the process of making art – since the knowledge an artist needs is absorbed only as it is proven in the laboratory of his experience. One can have a tremendous intellectual grasp and be incapable of putting down a cogent mark on a piece of paper. The study of art is very much concerned with the putting down of the mark. And this is the slow and lengthy process. 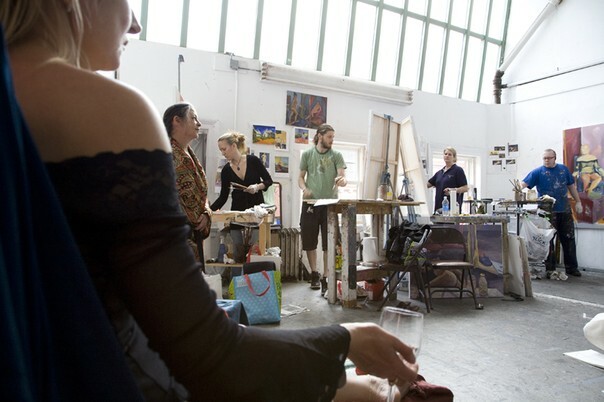 Art education – on the college level – whether it be in an accredited art school or university art department offers a rich menu of courses including academic studies, courses in applied art as well as art. But translated into the day-by-day experience of the art student, this simply means that he can never work. It is based on the false assumption that the pertinent information concerning art can be stored away for some future when there will be time to work. For this reason, I consider art education, in so many cases, a farce, a packaged deal: the student receives the compensation of a degree in exchange for giving up the training he really wanted to have. A Bachelor of Fine Arts degree is usually a certificate of the fact that its recipient has not been studying art at Such-and-Such a college for four years. At the graduate level, the situation changes but may often be equally false. Though here there is time to work, students are treated as though their period of study were behind them. Now is the time to “find their own thing,” to become professional at doing it and to produce. If it is not possible to get to New York to see “where it’s at,” there is always Artforum. For their Master of Fine Arts, they must develop a verbal rationale for their “thing.” Often the verbal apology is extensive and complex, the actual work slight – not in size but in substance. However, it is presentable, professional-looking, and there is lots of it. To me, all this is deplorable. Artists who have interested me have never – even in their ultimate maturity – enjoyed the complacency of considering themselves pros. They are too consumed by anxiety about what they want to do, which they rarely feel they’ve done, to think in those terms. I think of Matisse in his old age carefully drawing a leaf, Cezanne in his last letter determining to “continue his studies,” Giacometti racing with time to finally put down what he saw. For a young artist, to presume to be a pro, often in a way that merely disguises his naivete under a fashionable formula, is preposterous. But it is a result directly encouraged by current art education. Of course, there are always students who are not conned into accepting this situation. Usually in the past there has been the atelier of a great artist-teacher to turn to as an alternative to the establishment. Here, for generations, it was Hans Hoffman’s school, the closing of which in 1958 left a terrible vaccuum. In 1964, some dissatisfied students took matters into their own hands and, having asked me to help them as an artist they knew to be sympathetic, they went to the great trouble of creating an atelier school for themselves. It was in the spirit of a crusade that a loft was taken, the necessary equipment built by them and their slender savings, when they had any, put in to make it possible. It was in the same spirit that the extraordinary faculty they enlisted (it later included Hans Hoffman as well) gave drawings at the start and fairly subsidized the school all along by giving generously of their time for less than normal return. There could be no greater testimony to the recognized need for schools such as this than the support artists have given this one. Since then, other “studio schools,” inspired by the first and prompted by the same lack of opportunity, have been started in various cities here and in Canada. The virtue of an atelier school is its complete authenticity, its appropriateness to the purpose it serves. There is no compromise. For the study of art, it provides an artist’s domain and involves the focus on work which is an artist’s way of life. Any young artists whose intent extends beyond immediate success should devote themselves to a period of study in such circumstances, hopefully with an artist of caliber and insight. On the subject of quick success, I recall an apt remark by Willem de Kooning. It was prompted by the show of a mutual friend who in his impatience to succeed, had exhibited prematurely. When the study of art serves the ambition de Kooning meant, it finds its proper focus. § 18 Responses to How Do You Learn to Be an Artist? I had drawing class with Mercedes at The Studio School near the end of her life. I will never forget two comments she made about the drawings I was working on. The second, “it’s a good drawing,” said with devastating ennui. But she was so right in both cases! The first drawing had all these extraneous sort of this-is-what-a-good-drawing-must-look-like marks all over it. But, in fact, the underlying drawing was not bad. The second drawing was “good,” but tedious, safe, boring. Great to reread this essay. Thank you. Wonderful story, Nomi. Regarding a painting of the sort you describe, Ben Summerford, one of my teachers at American U., said to me, “You’re too good for that!,” a masterful mix of praise and criticism. He was right but it took me a few years to realize it. Great teachers are a bit like Zen masters. Ah! the wonder of the internet! I’m searching for any current exhibit of Matter’s work, and I find this. It’s bookmarked now, and I’ll be back to read it later (after I’ve given up on the exhibits). Thanks for posting this; I am delighted to find it. I’m a bit late but thanks for your comments. I’d be interested to know what you’ve found. Mercedes was an exceptional being, warts and all! She never betrayed her passion for art and managed to pass it onto many of her students. I had the privilege to “teach” for several years at the NY Studio School (brought in by Mercedes) before it became just another degree-granting institution and, simply put, that experience has made it impossible for me to ever teach again in a “regular” art school. The Studio School in those days (I was there from 1978 to 1984) was the most “real” place of learning I have ever been associated with, and that “real” quality was the child of Mercedes’ passion. I still miss her, though I catch myself often having conversations with her, there’s so much going on these days in the art world that we would enjoy criticizing together (careerism, thin art and all). Thanks for sharing your thoughts and experiences Jean. I never knew Mercedes Matter, but know many of her students. I never met this women, never heard of her at all until a few hours ago, when I googled “How do you learn to be an artist?” and divinely this article appeared. I am a public school elementary teacher in the State of Delaware and I cry often. I am sure that Mercedes Matter’s would have found me a beginning artist at best. Born in 1981, I have done what many did, went to college to teach art, got their first job and are still there 11 years later, never getting the “time” to truly create on my own. I cry because art education is DEAD. I teach kids. I loved to watch them create, laugh, and have fun doing what I would love to do, given the time. Yes, they made messes and I spent 90% of my time cleaning up after them, but they could create. They could draw. They could paint. I was able to show children the joy of being an artist and why so many of us wanted to be an artist. TODAY art education is DEAD, so I cry. This year I have seen each child in my school for six 50-minute art classes and each child in my school has made ONE 9by12 piece of art. ONE, so I cry. My students talk, discuss, and write, complete graphic organizers and complete assessments until the cows come home. I do not make them do this because I want too, but because my ability to teach them depends on it. If you are not horrified enough, please check out this link to my evaluation process. http://www.doe.k12.de.us/csa/dpasii/default.shtml The DEATH of art education is here, so I cry. I wish I could have known Mercedes Matter. Her words here truly MATTER. Wonderful post. Thank you for sharing this. I’ve been teaching outside academia for 20 years and it’s always nice to read positive thoughts on the subject. Such an inspirational and powerfully thought-provoking read. When I was a child Mercedes and my mother were good friends. They shared a house one summer on Georgica Pond, close to where Jackson Pollock lived, near East Hampton. I was only about 5 then. Many years later and many years ago, when I visited the Studio School with Lani, we sat in on one of Mercedes drawing classes for a little while, and from what we saw and what Mercedes was saying to a student, we both wanted to stay there to study drawing with Mercedes. I was teaching at American University then, and we didn’t study with Mercedes. Her students were making drawings Lani and I thought made our own drawings look meaningless. It was clear to us that Mercedes was an extraordinary teacher. As a young student a decade after this article I was made to conform to the anti- mode of this argument. For example to be tuned in only to current ideas. And if there weren’t any, to make them up. Since, as well as during, I am aware this was the norm in British art schools and any others were the exception, for example Edinburgh in the 1980’s, where students were taught traditional values, and the ideas of several committed tutors. The exceptionality of the few was determined by the mediocrity of the majority in art teaching. You are currently reading How Do You Learn to Be an Artist? at Painting OWU.